This Is My Faster! : I Bet I Sweatin' More Than You! I hit a running milestone today! I ran 5 miles non-stop!!! That's probably not a big deal for most people but I've never run 5 miles non-stop before so it's a very big deal for me! Unless you were also running in the 88% humidity this morning I'm pretty sure I win the prize for the sweatiest runner! 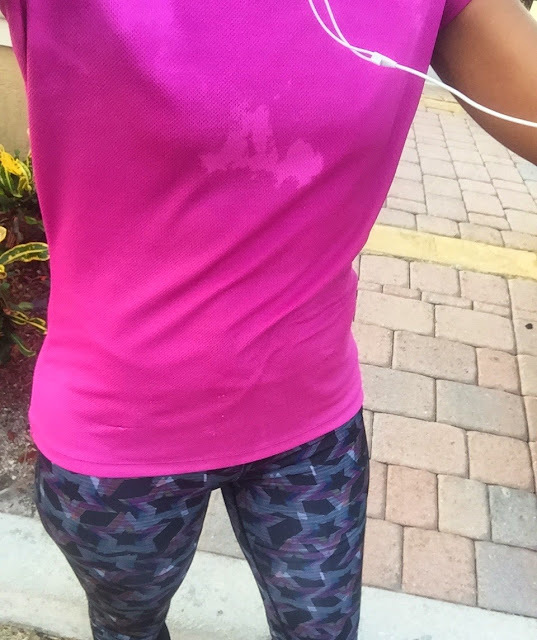 Because I tend to sweat a lot (I bet more than you ;) or at the very least more than most), the humidity will continue to be a big concern for me as my mileage continues to increase and as I get deeper into the Summer months of training. I don't normally bring hydration with me during the shorter mid-week runs that I do, but during my long runs I'm trying to start training my body to rely on water at designated areas ( approximately 2 miles apart) along the route. The Chicago Marathon course has about 20 water stations every 1-2 miles, so I figured if train my body to anticipate water every 2 miles that would help me prepare for what to expect at the race. 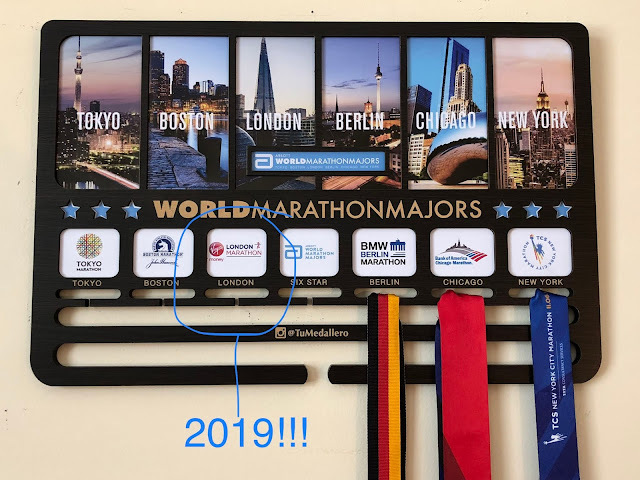 My current plan is to run the race without my hydration belt (which is why I am choosing to train without it). I'm a big supporter of the hydration belt, but at my last two half marathons (Miami Beach and Sarasota) I ran without it and I actually preferred not having it bouncing around as I ran. Plus when I run with water on me I tend to over hydrate, convincing my body that I need water when I don't, and end up with stomach cramps or stitches. Do you know CPR? 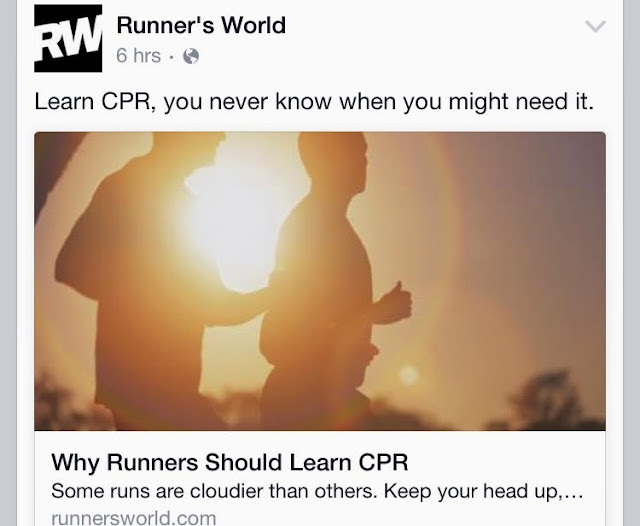 Would you be willing to perform CPR if you saw another runner collapse? What's the longest distance you've run non-stop? Do you prefer to hydrate with water or Gatorade? GREAT job! What an accomplishment! I remember the first time I ran 6 miles without stopping (I also remember my first 3 and 4 mile run, for some reason, not 5). I remember thinking I could rule the world after that run. There's no stopping you now! :) You are ready for a 10k! My longest run ever was 13.2 in a half marathon. That was plenty long enough for me. Thanks Jan! I felt great!!!! My goal is to be able to run a 10K non stop. I know after this 5 mile run I will be able to get there soon :) Do you have any more half marathons coming up? Congrats on 5 miles! I remember that feeling too and it's awesome! I love hitting new distances. Good luck with your hydration plan, I feel the same way about over-drinking. Thanks Kristen! I'm still on cloud 9 about that run :) So far the hydration plan has been working ok but I need to figure out what's going to happen as my long run distances start increasing.